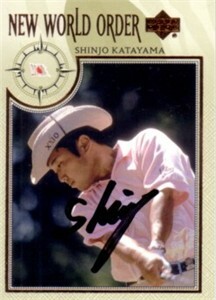 2002 Upper Deck New World Order golf card autographed by Japanese PGA Tour star Shingo Katayama (Upper Deck misspelled his first name). Obtained in person at Southern California PGA Tour event. With certificate of authenticity from AutographsForSale.com.